The United States Mint has a 223-year history of striking brilliant circulation and commemorative coins that bear iconic American images. While Liberty and the bald eagle have been featured on countless coins over the past century, they have never been featured in the manner they have been captured on the Mint’s newest coin. The 2015-W 1 oz Gold High Relief Liberty Coin is now available on Silver.com. Mintage capped at a total of just 50,000 by the US Mint. Consists of a true weight of one troy ounce of .9999 fine gold. Part of the First Strike Series from the US Mint. Coins ship in a protective plastic slab courtesy of the PCGS. Liberty has appeared on countless US coins during the US Mint’s production history, but Augustus Saint-Gaudens was the first to capture her beauty in full-length figure in 1905. His original design was revived in the brilliant ultra-high relief striking he intended in 2009. The US Mint built upon that coin with the new 2015 Gold High Relief Liberty Coin. 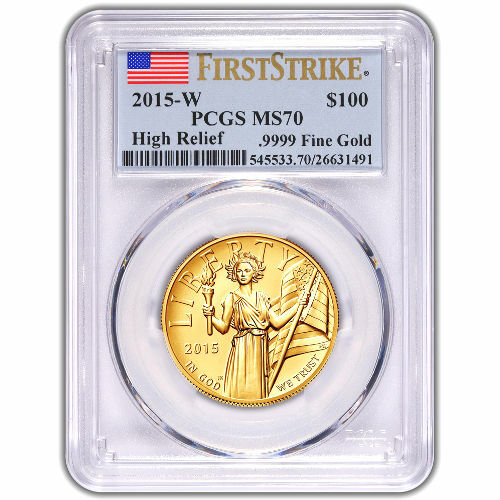 Each of the coins available in this product listing features a perfect MS70 grade from the PCGS. A perfect coin has its full, original mint luster and no detracting flaws. As part of the First Strike Series, these coins were received by the PCGS within the first 30 days of their release in 2015. On the obverse side of each coin is artist Justin Kunz’s modern vision of Lady Liberty. Featured with a youthful appearance, Liberty has a torch in her right hand and grasps the American flag in her left. The reverse face bears the image of a bald eagle soaring into the sky holding an olive branch in its talons. Both Kunz and reverse designer Paul Balan are artists in the United States Mint Artistic Infusion Program. Both men’s designs offer a modern interpretation of national icons that are fixtures of American coinage. If you have any questions, feel free to reach out to a Silver.com associate. You can reach us on the phone at 888-989-7223, online using our live web chat, and via email. If you are interested in similar products, be sure to check out our selection of Proof Silver Coins.